(NaturalNews) One of the primary lessons being learned from the Ebola crisis is that fancy meds and vaccines aren't needed to cure the disease. Simple water, it turns out, is one of the best treatments for the hemorrhagic illness, supplying the body with much-needed hydration that is quickly lost when the advanced stages of nausea and vomiting begin to develop. 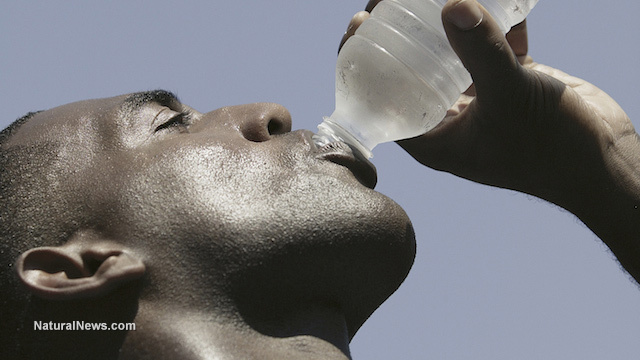 Drinking four liters, or about one gallon, of water daily is critical for surviving the infection, say scientists. And rehydration solutions containing water with added minerals like potassium and magnesium are even better for overcoming the extreme shock that occurs when the body loses too much water, such as with Ebola. "When people are infected, they get dry as a crisp really quickly," said Simon Mardel, an emergency room doctor advising the World Health Organization (WHO) on Ebola in Sierra Leone, the second-hardest-hit country besides Liberia. "Then the tragedy is that they don't want to drink." Water was the key to saving two American healthcare workers who were treated for Ebola at Emory University Hospital in Atlanta, Georgia, this past summer. A study published in the New England Journal of Medicine (NEJM) explains how intravenous rehydration corrected their electrolyte deficiencies and intramuscular water losses, allowing for more rapid and efficient healing. "We undertook aggressive supportive measures of hydration (typically, 3 to 5 liters of intravenous fluids per day early in the course of care) and electrolyte correction," explains the study. "As the patients' condition improved clinically, there was a concomitant decline in the amount of virus detected in plasma." Concerning diarrheal diseases such as Ebola, it is typically dehydration itself that ultimately results in the victim's death. Ada Igonoh, one of the doctors who contracted Ebola back in July while working in West Africa, says oral rehydration salts, or ORS, mixed with water helped heal her gastrointestinal symptoms. "As I took the ORS and treated dehydration, it provided me with energy, and my immune system was able to battle the virus," wrote Igonoh in an email to Bloomberg. "I knew that in diarrheal diseases, shock from dehydration is the number one cause of death. From my research on Ebola while in isolation, I found that to be true." Usually with health conditions that involve profuse sweating, vomiting, diarrhea or other forms of water loss, victims aren't in the mood to eat or drink. This creates even more dehydration and electrolyte loss, which if left untreated can cause the vital organs to shut down and the digestive tract to simply deactivate. "You don't want to drink, then you're too weak," added Mardel during a phone interview. "In the last stage, you're in shock and your gut has shut down." Reducing mortality, he says, is as simple as making sure victims get enough water, even if this means injecting it into them intravenously. He also suggests avoiding certain medications like aspirin and ibuprofen that can intensify bleeding and water loss. "We will halve the mortality by firstly just stopping anti-inflammatories and giving hydration, and really pushing it," he stated. "I want every man and woman in Sierra Leone to know this. I want sports personalities to be talking about it. I want everybody to be talking about it."